This is the place to go for information about all of Studio Ghibli's wonderful films, including "Kiki's Delivery Service," where I get my nickname from. This has been the single most inspirational art event of my life. I came back from Burning Man 1998 with project ideas coming out of my ears! And those projects became even bigger than perhaps I could handle! :) I don't think I would've ever been able to reach so far to the limit of my abilities. Truly, an event which made me better, stronger and live life more fully! This is another project I'm currently working on. Red, Green and Blue are the primary colors of light. From these lights, virtually all the colors of the spectrum can be made. 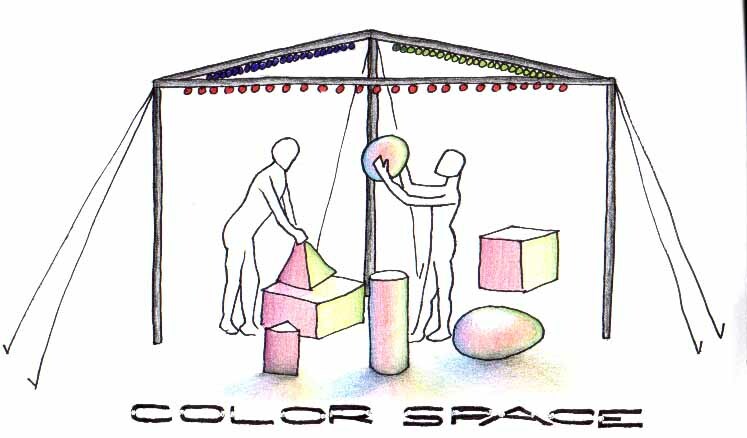 If RGB are considered axes in a "space" then each color may be translated to a position in space. 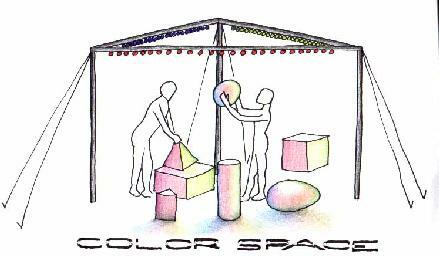 Color Space is a translation from color into a 3D spacial world. Whatever is within the space changes color depending on which direction it faces, and where it is located. Even shadows will have different colors. Folks can explore this space firsthand, using geometric shapes, or even their own bodies. It will be in Center Camp at Burning Man this year! This is a project my best friend Steph is working on. It is a funeral procession for all the people that we were not... It will be to let those selves go to rest in peace. This is Steph's project for Burning Man this year. There is currently a big order going on for electroluminescent wire. This was used to make the bicycle-horse at Burning Man last year, among other amazing pieces of artwork. It's a thin line of glowing wire, like minature neon. This is the group I camped with in 1999 at Burning Man. Great bunch of folks! This is our town that will be returning every year. This year, our project is the Crystal Palace, conceived by Steph, mentioned above who built the Possible Selves Conglomerate. One of my all-time favorite sites on the InterNet. I can spend hours reading this site!!! I just can't help it! This book sounds terribly interesting! that I spend all my holidays with them. A list of neon bookmarks I've collected -- lots of great info! What can I say? This has been around on the Net for years!